Capital letters aren't just for starting sentences. Here are 15 more interesting ways to make use of them. Internet vernacular uses all-caps for emphasis, often excitement or anger. Our alphabet actually used to be all-caps, all the time, since the earliest written forms of Latin didn't have lowercase at all. That's why uppercase tends to be boxier: It's easier to carve straight lines in a monument, whereas lowercase is more rounded because that's easier to shape with a pen. escaLATING CAPITALIZATION. you know, when you start out calmly in lowercase BUT THEN SOMETHING EXCITING HAPPENS. 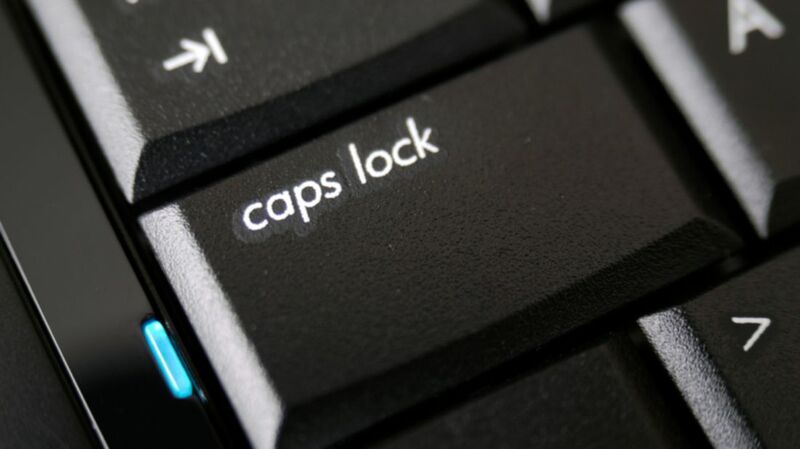 The caps lock key dates back to typewriters, when it was a lot harder to hold down shift for an entire word or phrase. With modern keyboards, people have proposed using its prime real estate for something else. That possibly-retro style where you alternate caps with each word. Pair with sparkly unicorn punctuation. CamelCase is the tamer cousin of studly caps, where you add a capital in the middle of a compound word to make it rise up like a camel's hump. Common in brand names (PowerPoint, MasterCard, LinkedIn) and speculative fiction (RejoovenEsence in Oryx and Crake). In standard English, we capitalize proper Nouns, but that hasn't always been the Convention. Until the 19th Century, English used to capitalize all Nouns, just like modern German still does. You can see this in old Documents like the Declaration of Independence. Sometimes used with ™, ironic capitals indicate that something is a Very Important Idea. If you've got a lot of time on your hands, why not channel your inner scribe and adorn the capital at the beginning of your manuscript with a detailed illustration like this? Technically speaking, small caps are supposed to look slightly different from just capital letters in a smaller font. Real small caps are a little thicker and further apart than small-font capitals, to make them flow better with the rest of the text. Words like U-turn, T-shirt, A-frame, A-line, and S-curve have nothing to do with the meaning of the letters. Lowercase letters don't tend to be used for their shape, whether that's because they have less evocative shapes or simply that they're more easily confused for part of the actual word. Most writing systems just don't have any equivalent for capitals. We're used to them, but they're really only a thing in orthographies based off the Greek alphabet—the Roman, Cyrillic, Coptic, and Armenian alphabets. Not so in other writing systems, including Chinese, Japanese, Korean, Arabic, Hebrew, Hindi, and more. To them, capitalizing letters would be about as weird as capitalizing numbers would be for us. "What do you mean a capital 6? It's just 6!"